Bridge strikes are a serious issue. Over 2,000 incidents occur every year in the UK alone, causing millions of pounds of damage and thousands of hours of train delays. Recent court cases have now paved the way for negligent drivers and their employers to be fully liable for Network Rail delays as well as repair costs. HGV drivers are responsible for paying full attention to road signs, road conditions and being fully aware of the height, width and weight of their vehicle. Failure to drive and navigate a safe route can also lead to a dangerous driving conviction, loss of licence and a heavy fine. Brand new updated version now allows input of more HGV details to calculate a safe and fuel efficient route. New from Snooper - Truckmate Pro S2700 with FREE Lifetime Map Updates. Super slim and with a 4.3" widescreen LCD, Truckmate Pro S2700 is our most affordable truck sat nav yet. Competitively priced it might be, but it's still packed full of useful features including FREE TMC traffic information, 10's of thousands of truck specific points of interest and of course Truckmate's unique truck and HGV routing software. Snooper Truckmate Pro S2700 with FREE Lifetime Map Updates. The most competitively priced sat nav available designed just for trucks. Super Slim with 4.3" widescreen LCD. Truckmate Pro is the result of years of development and was the first satellite navigation software with routing designed specifically for trucks, HGV and larger vehicles. Simply enter the height, width and weight of you vehicle and Truckmate will automatically calculate a route avoiding low bridges, weight restrictions and many other hazards. The best satellite navigation system designed specifically for trucks just got better! Now includes the following New Truckmate Pro features - Latest Here® Maps for Life (Formerly Navteq®) maps (See countries added below), Lane guidance, Junction view, Updated Truck Specific POI's with POI "Corridor" search, "My Speed" Speed limits database with on screen Alerts, Navigate by junction number, Your route, Adjustable map text and Route timer, all housed in a stylish slim Satin black casing. Latest Truckmate units now allow owners to save up to 10 different vehicle profiles, making it easy to switch and change between trucks and trailers and receive routing specific to that vehicle. You can even save the load type you carry with the vehicle profile. TRUCKMATE is the first portable sat nav system to include dedicated routing designed specifically for trucks and large vehicles - plus Snooper's multi award winning speed camera location technology. First launched on the S2000 with a 4.3" LCD display, Truckmate has been a huge success and welcomed by drivers and fleet operators alike. Truckmate has won many accolades and awards and is sold by all the major truck manufacturers from Volvo to DAF. The best street level navigation from Here® Maps for Life (Formerly Navteq®), snooper's award winning GPS speed camera detection, dynamic snooper TRUCKMATE routing and FREE live RDS-TMC Premium traffic information technology. The Snooper S2700 TRUCKMATE PRO satellite navigation system is the result of many months of development based on our research of the industry and feedback from the 1000's of truck drivers already using Truckmate. As a result Truckmate is the most comprehensive portable sat nav system designed specifically for trucks on the market. Truckmate uses Here(TM) transport data at it's core, but Truckmate is further enhanced but 1000's more attributes combining to give far more comprehensive cover of hazards on more roads than any other system on the market. S2700 TRUCKMATE PRO - What's new? Enhancing the user experience, S2700 Truckmate Pro has a faster 800 mHz CPU processor than it's predecessor S2500, delivering smoother graphics and menu selection. Truckmate S2700 includes a completely new and updated menu design. Brighter, stylish and sleek. To ensure that you always have the very latest Truckmate Pro software and street level mapping available, S2700 Truckmate Pro comes with FREE Lifetime Map Updates as standard. Simply register your unit online after purchase and receive free map updates for the life of your unit. Instructions for online registration are enclosed. See our Truckmate page to read more about Snooper's Award Winning Truckmate software in Trucking Magazine's annual truck sat nav test. Ensuring all new units have the very latest in street level mapping provided by Here® Maps for Life (Formerly Navteq®), we offer a map guarantee for the first 30 days after initial GPS connection. The speed limit of nearly every road across Europe can now be clearly displayed on your S2700 Truckmate Pro at all times. Choose between speed limits for cars and advisory speed limits for trucks from 3.5t and over. In addition, My Speed can also be set to alert you if you accidentally exceed the speed limit at any time. All Truckmate Satellite Navigation systems come with Air1® AdBlue Retail Filling Station POI. Select AdBlue POI and Truckmate will show and guide you to the nearest filling station. You can even add an Air1® AdBlue stop into your route with corridor search. You couldn't have missed the almost weekly press reports of a truck or large vehicle getting sent along an inappropriate route by an inept sat nav system. Almost all these stories end in disaster with the vehicle concerned stranded in a field, wedged under a bridge and even destroying property. It is reported that there has been millions of pounds worth of damage caused as drivers use portable satellite navigation systems designed for cars to navigate commercial vehicles. The first portable satellite navigation system to include dedicated routing designed specifically for trucks and large vehicles such as coaches, buses and mobile homes - plus Snooper's multi-award winning speed camera location technology. This unique software will create a route based on the attributes of your particluar vehicle. Simply tell the unit the size and weight of your vehicle, plus the type of load if applicable and Snooper's TRUCKMATE software will calculate a safe, truck friendly route. Routes will be calculated based on roads with adequate width and height, excluding roads with low bridges or weight restrictions plus other hazards. Over 2 million POI's across Europe. Truck specific points of interst list plus Hotels, restaurants, petrol stations, speed cameras, golf courses, cash machines, airports, train stations, shops plus many more. Go straight to your destination at the touch of a button. The systems unique software will create a route based on the attributes of your particular vehicle. Simply tell the unit the size and weight of your vehicle, plus the type of load if applicable and Snooper's TRUCKMATE software will calculate a safe, truck friendly route. Routes will be calculated based on roads with adequate width and height, excluding roads with low bridges or weight restrictions plus other hazards. If you drive for a living you will know the importance of needing to know exactly what lies ahead. Accurate and reliable information is a must to ensure that you arrive on time. Truckmate Pro's Traffic information is fed from 100's of thousands of vehicles and sensors across the country providing up to the second information. Truckmate's FREE TMC service will then alert you to traffic incidents across the country. If there is congestion on your route simply ask Truckmate to find an alternative route around it. A satellite navigation system is only as good as its mapping software - this is why Snooper S2700 utilises Here® Maps for Life street level mapping, ensuring that you can travel from A to B using the best route possible and more importantly, without getting you lost. By using Here® Maps for Life digital map data, the S2700 is able to offer accurancy, detail, reliability, and flexibility providing you with a highly accurate representation of the detailed road network. To ensure the most accurate postcode search available S2700 Truckmate Pro uses Royal Mail. The most comprehensive of it's kind. Recognised as the industry leader in digital street level mapping, TRUCKMATE uses Here® Maps for Life data. Ensuring you are taken seamlessly from A to B on the best possible route. Truckmate also includes full postcode search. Truckmate uses Here® Maps for Life transport data to provide the core truck data. However Truckmate also incorporates additional information ensuring more comprehensive cover than other sat navs using the standard Navteq package. Truckmate offers greater cover on smaller, narrower roads where it is most needed. Truckmate has more hazard information on more roads across Europe than any other portable sat nav system designed for trucks. 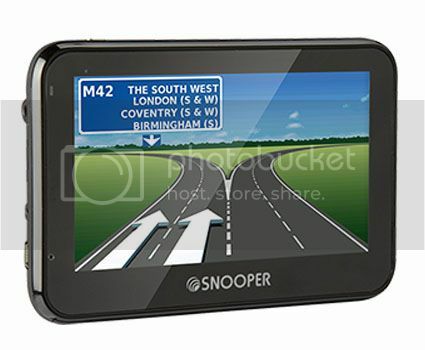 Snooper's Truckmate sat nav will save you £££'s in fuel and time! Snooper understand the difficulties of fast moving technologies. No sooner have you purchased a new PC or Television and it's already out of date, that's why free software* updates are included. As Snooper's Truckmate technology get's better and better you can keep up, knowing you have always got the most up to date software on the market! There is no need to set the detection range of the S2700, as it automatically calculates the distance required depending on the speed limit. For instance it will alert you 200 meters in advance in a 30mph zone and up to 500 meters in a 70mph zone. The S2700 comes complete with a neat windscreen mounting kit and in-car power lead. It requires no installation and can easily be moved from vehicle to vehicle in a matter of seconds if required. Snooper Services provides access to the AURA Truck specific speed camera database. John Beddow is an HGV driver for Uniloads, the country's leading specialist in the delivery of commercial vehicles throughout the UK and Europe. I drive a number of different sizes and types of trucks, and TRUCKMATE has proved invaluable. Although I've used sat navs for years and they've all saved me time, I often used to find myself going 15 miles out of the way before realising I couldn't go any further. Nothing removes the unique hassles of truck driving like TRUCKMATE. Andy Saunders drives for the UK's leading manufacturer of natural stone and concrete hard-landscaping products. There's nothing like TRUCKMATE on the market, and there's no comparison with other brands. Every other sat nav was designed for cars, but TRUCKMATE was clearly made with commercial vehicles in mind. Because of the specific restrictions we face every day in our jobs, it's immensely useful for driving in the city and in the country. I recently lent my device to one of my colleagues, and he didn't want to let it go! *Please note Snooper S2700 TRUCKMATE PRO is supplied complete and ready to use with all thats required supplied in the box.The above items are optional extras.